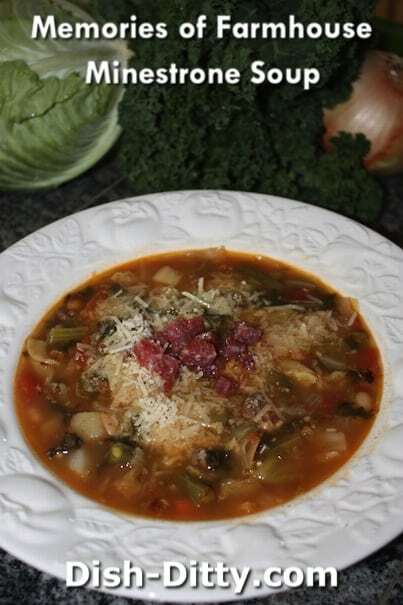 This is my recreation of a soup from a long ago restaurant in Redwood City California called The Farmhouse. That was the best soup I have ever had, and this recipe was created with that soup in mind. 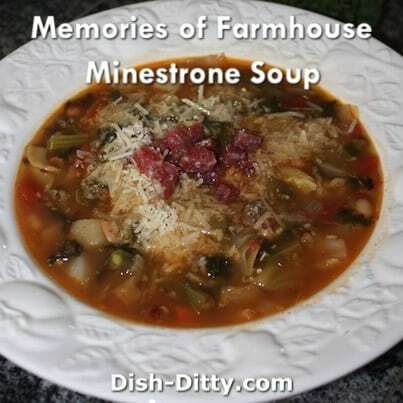 I have so many fond memories of the minestrone soup from the long gone Farmhouse Restaurant in Redwood City California. I found one recipe on the web that claimed it was the Farmhouse recipe, but it was missing a little something, so I altered it to match my memory. I came pretty close to my memory of that standout minestrone soup recipe. This soup really gets it’s complexity by the way the ingredients are layered together. The original recipe can be found at the San Jose Mercury News website. This soup takes 2 days to make if using dried beans. I found that it did taste better with the dried beans, but if you are like me and forget to soak the beans, you can substitute with 3 cans of white beans. Soup can be made up to 3 days in advance. Alternatively, you can use 7 cups beef broth and omit the meat. When doing that, keep the wine and add at the same time as the broth. In large bowl, soak beans overnight with enough water to cover by 2 inches. Add salt and pepper to beef and set aside. Drain beans. In a saucepan, combine beans with enough water to cover by 2 inches; simmer uncovered until tender. Continue to step 2 while the beans cook for 45 minutes to 1 hour, adding water to keep beans barely covered. Keep covered and remove from heat when beans are done. While beans are cooking, prepare the broth: In a large pot, add 1 Tbl olive oil and heat on medium high. Add beef and cook about 3-4 minutes to brown the beef. Add the wine and better than bouillon base and cook for about 2-3 minutes. Add water and bring to a boil. 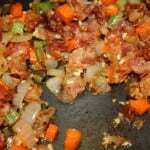 Reduce heat, cover and simmer for about 30 minutes while you chop vegetables. Keep covered and remove from heat while you work on preparing the soup. 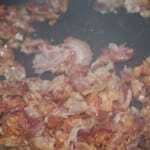 In heavy soup pot, cook pancetta in 2 Tbl oil, stirring, until crisp and pale golden, about 5 minutes. 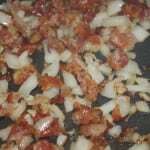 Add onion; cook, stirring, until soft, about 5 minutes. Add carrots, celery and garlic; cook, stirring for about 4 minutes. Add potatoes and zucchini; cook stirring for about 4 minutes. Add kale, cabbage and baby spinach; cook until wilted, about 5 minutes. Add pasta to soup, stir, cover and continue to next step. Drain beans, but reserve 1 cup of liquid. Puree half the beans with 1 cup reserved liquid. Stir puree and remaining beans into soup; simmer uncovered 10 minutes. Day 2: 0 minutes! Time to EAT! Season with salt and pepper to taste (I felt it didn’t need any). 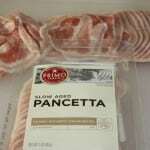 Serve topped with parmesan cheese and pancetta with soft italian bread on the side. 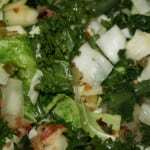 I found this recipe online in a Q/A section of Yahoo. It is similar to what I have above, but I figured it’s best to give different recipe options. Here ya go! Drain the white beans, reserving the liquid, in a blender or food processor puree half of them with 1 cup of the reserved liquid, and stir the puree and the remaining white beans into the soup. Simmer the soup, uncovered, for 15 minutes, thin it if desired with some of the remaining reserve liquid, and season it with salt and pepper. The soup may be made 3 days in advance and kept covered and chilled. Reheat the soup, thinning it with water as desired. Serve the soup with the Parmesan, the bruschetta, and the sausages. 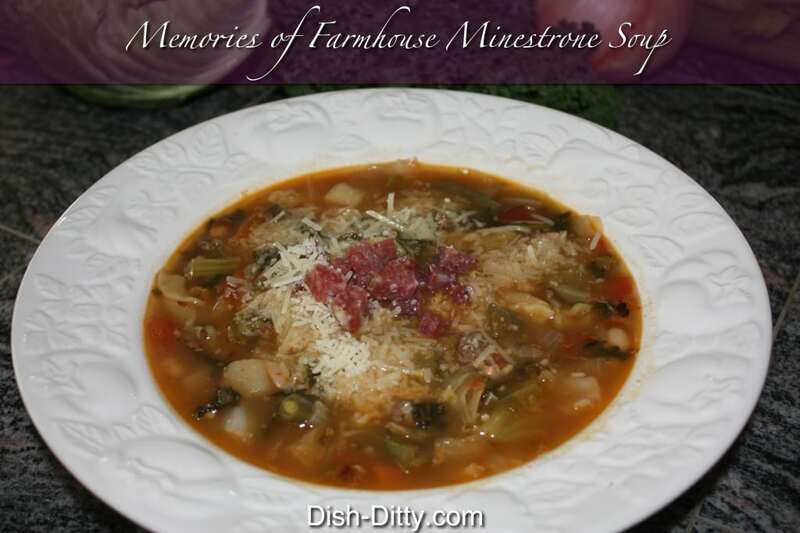 8 Replies to "Memories of Farmhouse Minestrone Soup Recipe"
Thank you! I have such fond memories of eating at The Farmhouse with my Grandparents while growing up! It popped into my mind this evening, and I decided to see if there was anything online about it. I am excited to try your minestrone recipe. You are welcome. I searched and searched when I was looking and only found the one recipe which didn’t match up to my memory of the soup. I really think they used the beef bones from the prime rib in the stock. That’s my guess at least. Let me know how close it matches. Enjoy! Thank you for doing this. Childhood favorite! 🙂 It was one of the first “nice” restaurants my husband took me to (at that time we were just dating). We were so sad when they closed down. I’m going to try to make a simplified version of this recipe this winter. Stay tuned! I have been craving this soup for years! Thank you for sharing. I too have fond family memories from the FarmHouse. I will try to make the soup this weekend. Now if I could only find the recipe for the dutch almond torte with raspberry from a bakery in San Carlos! That was the greatest minestrone soup ever. I judge all minestrone soup comparing it the one at The Farmhouse and been disappointed every time for 30+. How could The Farmhouse go out of business! It was always full and everyone loved it. Best soup and bread. One of the great mysteries of the universe. Oh I am so glad! It is hard because our memories are 30 years old, but to me it was right. Hi! I also loved going to the Farmhouse in Redwood City, CA! My mom got me hooked on that minestrone soup…wish they were still here, darn it! LOL…Thanks for these recipes!